Heat the butter in a pan. Sauté the shallots, add the sugar, cook for a further 2 mins. Add the chestnuts and cook briefly. Pour in the water, bring to the boil, reduce the heat. Cover the soup and simmer for approx. 25 mins. Puree the soup, season. Beat the cream until light and fluffy. Plate up the soup, top with the cream and sprinkle with a little paprika. Spread the sambal oelek over the pastry dough, season with salt. Cut the dough crosswise into strips approx. 2 cm wide, twist into spirals. Place the pastry twists on a baking tray lined with baking paper, cover and chill for approx. 30 mins. Bake for approx. 10 mins. in the centre of an oven preheated to 220°C. 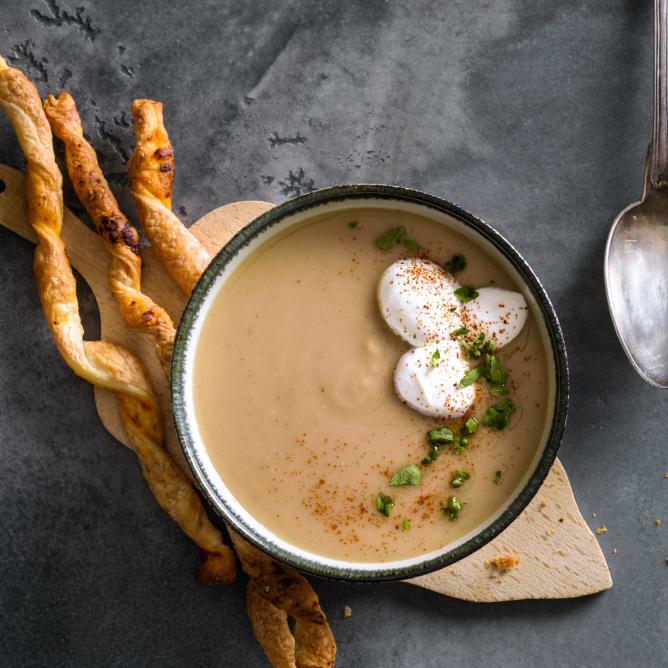 Serve the spicy puff pastry twists with the chestnut soup.